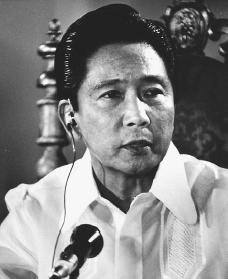 (1) Nothing truly positive could have come out of Marcos. (2) If others were given a chance to rule, they can even outdo Marcos. (3) Given more than 20 years, the combined efforts of succeeding regimes should surely far outweigh Marcos' accomplishments. But facts that could be empirically verified only indicate that none of those beliefs were true. I've been deeply regretting having rooted for Cory and the Aquinos. The only thing Cory and the Aquinos did was lower the bar of not only competence, and actual accomplishments, but also of responsibility, honesty, and accountability. The only department that has arguably accomplished anything in the Aquino gov't is their brainwashing/propaganda media department. No regime has so vigorously been so keen & have invested so much at ruining its political enemies and opposition, through hate campaigns and dirty politics, as the Aquino gov't(s). To have been brainwashed as you claimed, you must have a weak will and the mind of an idiot. A real thinking person would know better than the Aquinos and the Marcoses alike. You see, actual nationwide progress is economic stability trickling down to the masses. There HASN'T been one Philippine leader who has done the impossible. Until the popular political names have been eliminated from the minds of the imbeciles passing themselves as voters, this country will not prosper. This is an idiotic and simplistic article. There was more to the situation back then. Looking back at it this way and trying to convince others that all was for naught is another form of reverse brainwashing. There were a lot of factors that caused some setbacks during the intervening years such as global economics, entrenched patronage politics (brought about by Marial Law if I may add), not to mention the appearance of Megalomaniacs such as Gringo Honasa and Antonio Trillanes. There have been some gains and maybe you just refuse to see them. I still see it better than having the police and military possess a strong grip over our lives. And I, as a foreigner, can't even begin to tell you how many Filipino's I have talked to regarding Marcos, the Martial Law years, and much of the rest of his 21 years in office. And the one thing they ALL agree on, was during Martial Law, the country was so much better off. People were more organized and disciplined that ever before. No one was living in fear the way the mind-control machines of the last 25+ years have led you to believe. As for the economy during PFEM's time? Yes, it had its ups-and-downs. But for the most part, was definitely 10 times better off than it is today. I also read a recent article where Alan Peter Cayetano claimed that Gloria, Estrada, and even Marcos was associated with the DAP in some way. Now if that isn't the single stupidest thing I have ever heard from these goofs who call themselves the leaders of the people. How could ANYONE prior to 2010 be even remotely associated with something that was the creation of Aquino and his best buddy, Abad. I could go on and on. But one thing is for sure. No leader prior (let alone after) President Marcos have ever achieved his level of infrastructure greatness. Worse even, is that fact that everyone (with the possibly exception of Gloria) since the '86 EDSA1 disaster, have done nothing for this country and its people, except dig it deeper into the poverty abyss. While making themselves richer at the same time. can't agree more.. took part in 3 EDSA revolutions in my youth.. believing that life can get better for the Filipinos.. but now... it seems none of our leaders have any idea what it is to "love our country and our people." Those who blindly say that we're better off now are perhaps born rich or got to be reach after the Marcos Era..
For those who may not agree or are too blind to accept it.. step out of your comfort zone and try and live the lives of the below middle class sector of society.. Let's not talk about our poorest sectors.. I dare you..
thats not the whole truth. First of all a lot of bad things also happened during the martial law years like the arrests and extra judicial executions of political opponents. Some deserved it of course but some did not. apparent you just had the idiotic feel of the moment urge to react based on your limited grasp of information.. manahimik ka na lang..
go to the wikipedia article called "Economic history of the Philippines (1973–1986)"
What if the wiki page you are referring to is published by a biased author? Besides wiki pages can now be edited merely by anyone these days. Dig deeper.